What is the breed of my cat? 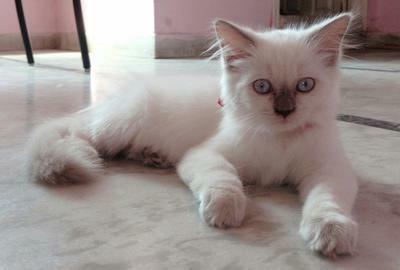 I have adopted a 3 months old male white kitten with blue eyes and tail that is smokey. He likes someone to be with him and is quiet. He plays after completing his naps. He is calm and friendly. I don't know much about cats but I'm very eager to know the breed of my kitten. Comments for What is the breed of my cat? 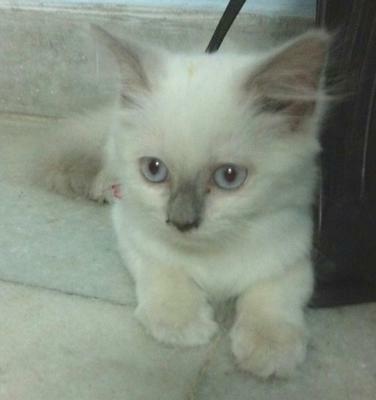 i believe it is a ragdoll ragdolls are very sweet kittens your gonna love her good luck! he looks like a blue pointed ragdoll, look them up for some pics on Google images.